Finely shred cabbage with a sharp knife and cut carrots into ribbons with a vegetable peeler (or finely chop carrots). Cook shredded cabbage in a wok or large frying pan over medium-high heat for about 7 – 10 minutes until crisp. While cabbage is cooking, mix all ingredients for the sauce together in a separate bowl. Pour sauce over cabbage and cook for an additional 1-2 minutes. 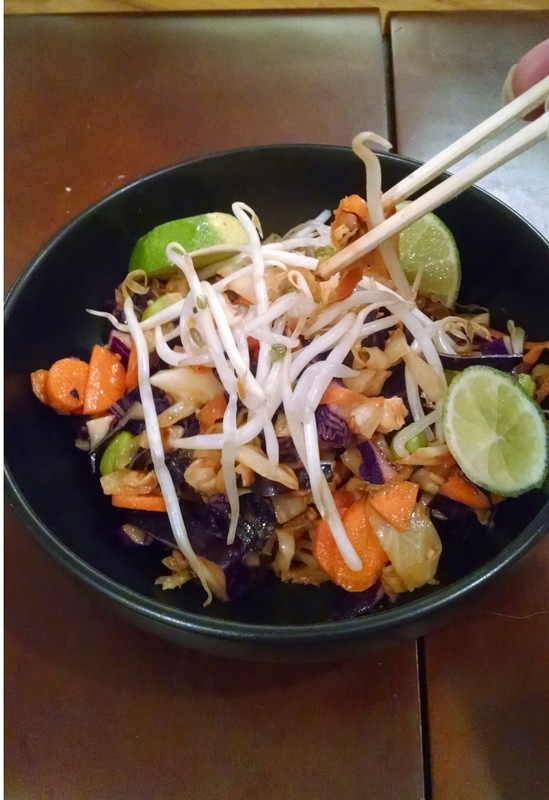 Plate and garnish with carrot ribbons, shredded red cabbage, edamame, and slices of lime.